The "Tarbut" school was built in 1921 near the market square synagogue. The whole community financed it. My brother Yaacov-Hirsh Elishkevich and Chaim Abramson were the initiators and founders of this school. This was a Zionist school. The teachers were Zionists. Top priority in the students' education were the love of Eretz Israel, Aliyah and settling the country. The students were taught Hebrew (Ashkenazi dialect), Hebrew literature, Bible, Talmud, Polish language, arithmetic, geography and nature. The school board did not allow technical subjects as they were considered to be secular studies. There was no kindergarten class until almost WWII. Instead there was Pre-School A for five and six year olds, and Pre-School B for seven year olds. Children in the Pre-School began to study reading, writing and arithmetic immediately. In First Grade, studies of reading, writing and arithmetic would continue. In Second Grade studies of Hebrew, geography and nature would begin. There were no classroom teachers. Instead each subject had its own teacher. Yaacov-Hirsh was teaching all the subjects except Talmud. Alter Podbereski was teaching Talmud. Initially the school consisted of six grades. In later years there were eight grades. The school board consisted of well respected people from the shtetl, who knew Talmud. The board generated the curriculum. No teachers were included in the board. Yudl - Yehuda Gurevich (An uncle of my husband, Mordechai Rogovin) - Ultra Orthodox. Talmudist. Isar Brekman - An accountant in "Vishnive Yidishe Pols Bank". Baruch Rabinovich - Isar's assistant in the Bank who had children in the school. Yosef Mendel Rabinovich - Very intelligent. Knowledgeable in Talmud. Father of Yehoshua Rabinovich (Former mayor of Tel-Aviv. Former finance minister in Yitzhak Rabin's first government). Rabbi Zvi Efron - Chief Rabbi of Vishnive. Yeshayahu Leib Podbereski - Talmudist. Hirshl Meltzer - Knowledgeable in Talmud. Grandfather of Shimon Peres (Former Israeli Prime Minister). Since it was a private school, the parents paid the teachers' salaries, monthly, through the Board. Financial aid for tuition was given by YACOPO to children whose parents could not afford the payment. In addition, every week volunteers would collect money all over town for the tuition of needy students. 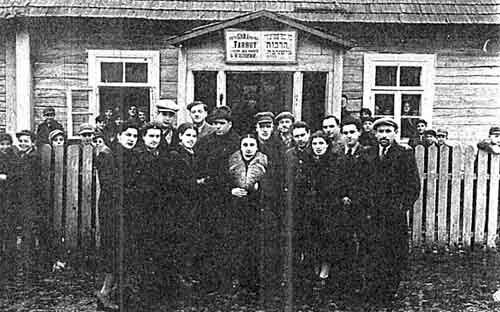 The school also accepted Jewish children from nearby shtetls which did not have a "Tarbut" school. For example, Rephael Elishkevich, my cousin from Ivenitz, studied in my school and lived with us. During the war most of the students did not study at all. Therefore, when the school was opened, each grade would consist of children of various ages. A 14 year old would study with a 10 year old . A 16 year old girl would study in the morning with a 9 year old boy, while at night she would go out on a date. The immediate goal was to help the students acquire basic skills (reading, writing and arithmetic) and only later move on to the other subjects. This was a co-ed school. The school grew larger over the years. Yehoshua Rabinovich, who was a student of my brother, studied in Vilna. Then he returned to Vishnive and joined Yaacov-Hirsh and Alter Podbereski as a teacher. In 1938, before my Aliyah to Eretz Israel, there were 200 students in eight grades, and a purely Hebrew-speaking kindergarten opened. Additional young teachers, graduates of the Vilna "Tarbut" Teacher's Seminarion (academy) joined the staff. Teachers began establishing their trade unions at that time. My brother became a member of the Vilna teachers' trade union. Teachers' earnings improved significantly. The Polish government allowed freedom of Jewish education.